Dig into some of our favorite dishes for the annual feast. Planning a Thanksgiving menu may seem easy—after all, you know what the main dish will be—but it’s not as straight forward as guests may think, especially if you don’t want to have a predictable spread that verges on boring. To avoid this fate, start planning now. From make-ahead appetizers to a roast turkey that takes less than an hour (yes, really!) to knockout desserts that go beyond pie, here’s a menu worthy of your table. 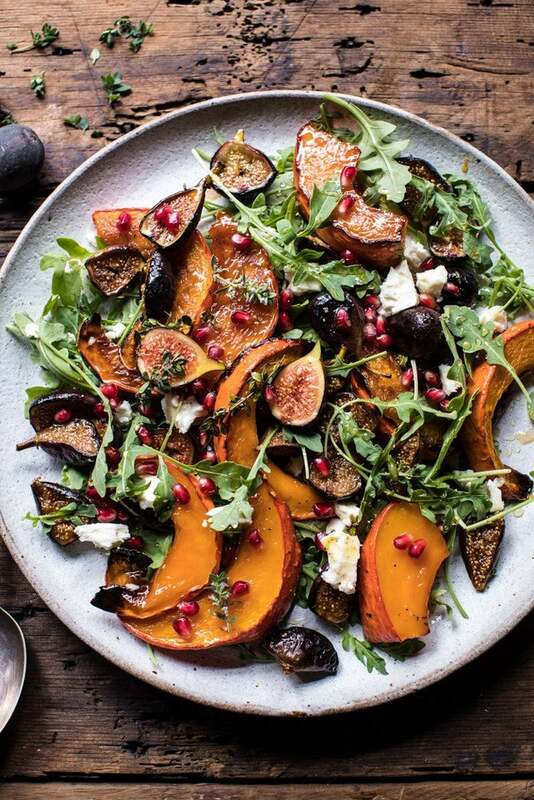 The autumnal salad to end all autumnal salads, this squash and fig concoction is just as delish as it is photogenic. Serve up buffet-style with the main course or as a quick appetizer to get those greens in. Flavorful and with an easy garnish that looks impressive, this aromatic beverage is a great way to elevate your pre-meal (or post-meal) cocktail hour. Incorporating the spices of the season, it’s the perfect fall drink to serve your guests. You’ll need something to balance out the influx of comfort food, after all. It’s vegan, packed with nutrients, and high on flavor thanks to various salad accouterments like crisp apple slices and sweet dried cranberries. Prep your ingredients for a big batch the morning of so that assembly only takes a few minutes when you’re ready to sit down. A Thanksgiving staple gets a fancy twist with crispy sage and decadent brown butter. It’s the ultimate comfort food and, since it’s a holiday, you have free reign to indulge in as many servings as you want. Don’t forget about Thanksgiving brunch! If you’re entertaining out-of-town guests, whip up a batch of these sweet potato waffles to start the big day off on a sweet note. This recipe from NYC’s Cafe Clover uses healthy takes on seasonal ingredients, so you can feel good about this breakfast before indulging later in the day. For a slightly more unorthodox (but nonetheless delicious) first course, try a hearty fall-appropriate soup. This silky and slightly sweet soup is ideal for colder weather. In need of a light aperitif? Go for this bourbon and apple cider cocktail from the Cherry Bombe cookbook, served with a splash of lemon juice and a bit of ginger for a refreshing drink to hand out to your guests while you wait for the meal to start. This fresh take on a fall favorite, courtesy of Athena Calderone, makes for a perfect side salad. A light lemony dressing ensures you won’t fill up before getting to the good stuff—AKA the pie. These make-ahead tartines feature a dynamic mix of sweet and savory notes thanks to the squash and tomatoes, while roasted pepitas add a delightful crunch. Make for an appetizer, or whip up for a tasty Thanksgiving brunch. Gooey heirloom heaven: a warm tomato and mozzarella combo salad. Not your typical deviled eggs. Pink beet dye adds some extra pizzazz to the crowd favorite app. Salads are usually an afterthought on Thanksgiving, but it’s time to change that. Hearty kale, juicy plums, and sweet squash mingle with the umami of parmesan and a splash of lime to make this side dish a winner. A southern twist on autumn’s acorn squash. This heartier side dish is an easy way to spruce up one of the season’s most predominant vegetables. More than just a side of squash. Try stuffing each with something unexpected—we love adding cherries and chestnuts for some textural interest. With their rich purple hue and earthy flavor, beets make a perfectly autumnal dish. Unexpected ingredients–clementines and walnuts–add a surge of flavor to cranberry sauce. An outrageously flavorful side dish that makes a great Thanksgiving side, and is slightly healthier that classic potatoes. A scrumptious side that incorporates many favorite stuffing flavors into one pan of cornbread. This article was originally published on November 2015, it has been updated with new information.